Sometimes things that are technically defects, such as imperfections in a material's crystal lattice, can actually produce changes in properties that open up new kinds of useful applications. New research from a team at MIT shows that such imperfections in a family of materials known as insulating metal oxides may be key to their performance for a variety of high-tech applications, such as nonvolatile memory chips and energy conversion technologies. The team demonstrated a theoretical framework and showed how the stability and structure of a point defect is altered under strong electric fields. 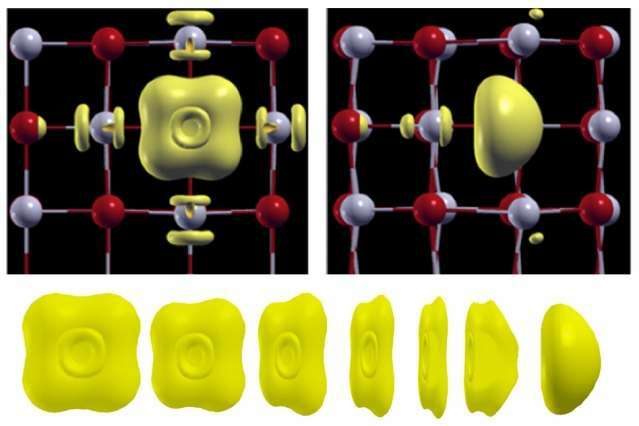 They took a common defect called a neutral oxygen vacancy—a place where an oxygen atom should appear in the lattice but instead two electrons are trapped. Their results have quantified the polarization behavior of the material with this defect, in an electric field. "This work establishes a new paradigm for the study of defects in semiconductors, by setting up the necessary mathematics for the calculation of the defect formation energy in electrically stimulated defective crystals," says Cesare Franchini, an associate professor of computational materials physics at the University of Vienna, who was not involved in this work. "This work extends the current theories which connect thermodynamics with electric polarization, and will be beneficial for virtually all applications in which defects (and their tunability by electric stimuli) are an asset, including catalysis, electronics, and electrocaloric devices."